Frightland is a haunted attraction scream park located in Middletown, Delaware. 2018 brings our 22nd season scaring and entertaining our guests. Featuring 8 unique and terrifying haunted attractions, including multiple haunted houses, a haunted hayride and more, Frightland has been named a “Scariest Haunted Attraction in America” by such international media outlets as Forbes, Huffington Post and Travel Channel. Frightland is located directly on Route 13 in Middletown, Delaware and is less than an hour drive from Philadelphia, Pennsylvania; southern New Jersey and Baltimore, Maryland. We are honored to entertain guests from the Mid-Atlantic region, around the country and as far away as New Zealand. 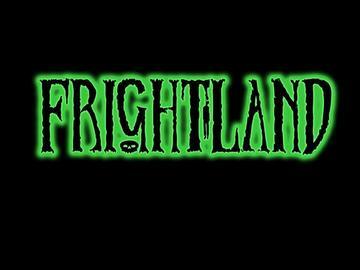 Frightland is open from late September to early November each Fall. A portion of ticket proceeds as well as 100% of parking proceeds benefit Leukemia Research Foundation of Delaware. There are no refunds. Except for preview weekend, your ticket is good any show night of the 2018 season through November 3rd. You must be in the E- Ticket booth line by 9pm to exchange your online voucher for a physical ticket. The hayride closes 30 minutes after the ticket booth. In the unlikely event we are closed due to extreme weather, your ticket will then become valid on any other night we are open this season. No alcohol, no smoking, no weapons, no touching of ghouls / props, no disorderly conduct, no profanity, no standing or reaching out of the hay wagon, no flashlights, no cell phone use while in the attractions, no cameras, no flashlights. SURVEILLANCE CAMERAS ARE IN USE. You will experience intense audio, lighting, extreme low visibility, strobe lights, fog, odors, damp or wet conditions, moving floors, special effects, sudden actions, you may get touched or wet, and an overall physically demanding environment. You may be touched. You SHOULD NOT enter Frightland if you suffer from asthma, heart conditions, are pregnant, prone to seizures, claustrophobic, have physical ailments, respiratory problems, or any other type of medical problem which would be exasperated by these or similar conditions. Frightland is not recommended for anyone wearing any form of cast, medical brace, using crutches, or have any type of physical limitations. DO NOT enter if you are taking medications which alter your function or are using drugs of any type. You will not be admitted and you will be escorted off of the property by police / security team if any rules are not followed. By entering the haunted attractions, you are in agreement and you acknowledge that you are entering Frightland Haunted Attractions at your own risk.